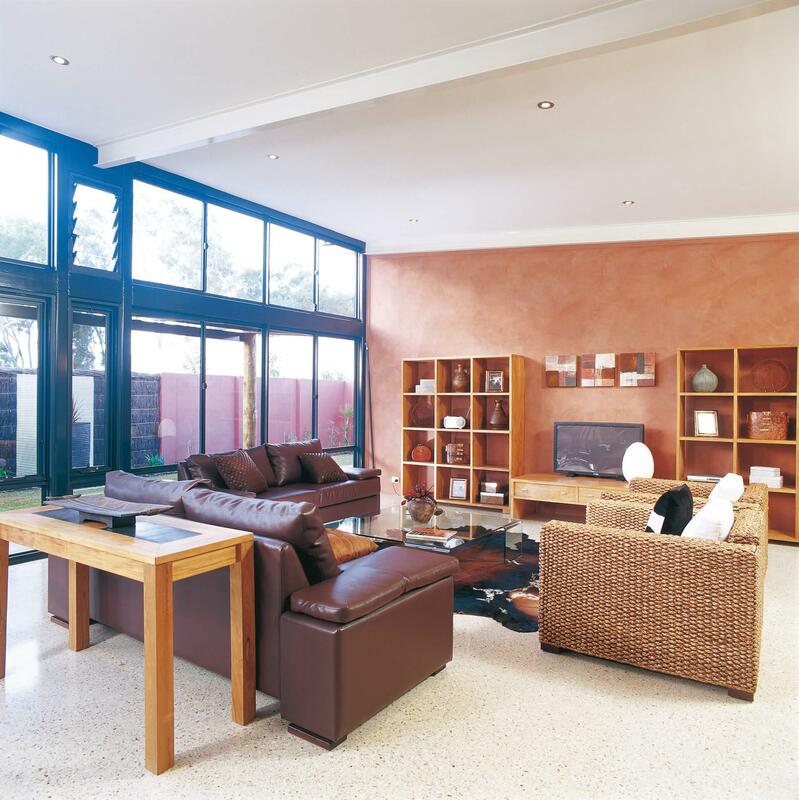 Around 2000 we designed a radical display home called The Skillion. 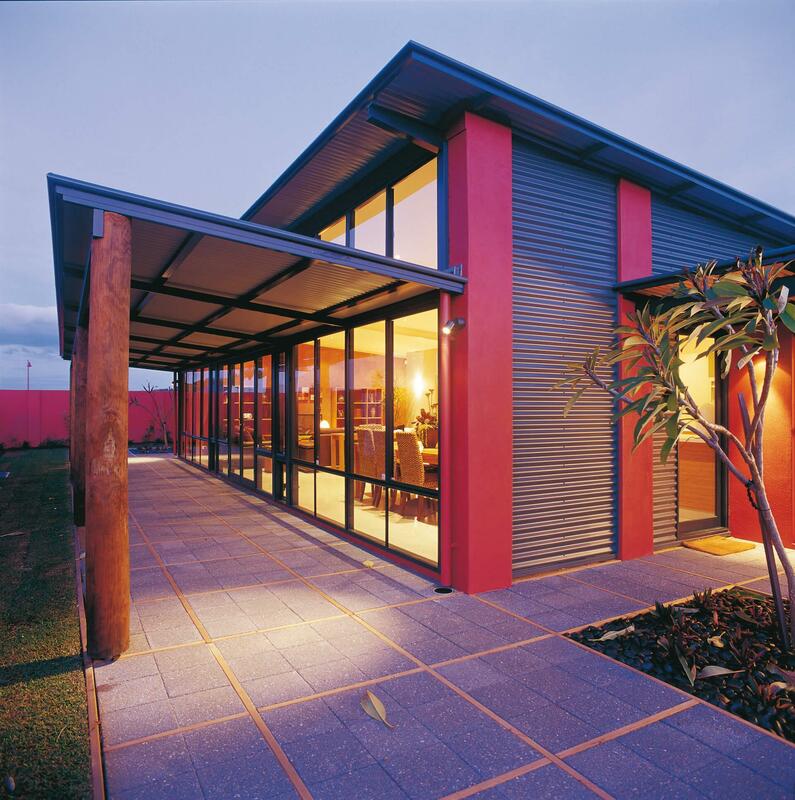 While this was a great success we decided not to replicate it but to introduce other elements into a skillion design to demonstrate and to increase the options available in a home style not displayed within the building industry of Western Australia. Hence the birth of a new and radical Rural Building Company home. As the name suggests we have brought a more earthy feel into the Rivergums. We have used more timber elements, a reverse pitched verandah and Colorbond claddings to give the home a more country atmosphere. The home is orientated with the glass towards the north. We have used the overhang of the Skillion, the side verandahs and the reversed pitched verandah to control the sun’s exposure to the inside of the home. The main verandah is designed to allow the winter sun into the home and into the verandah’s sitting area but excluded in its entirety in the summer. The overhang of the skillion is to throw the sun deeply into the main living area in winter and again excluded in the summer time. We have minimised the windows to the east and west. Bedrooms have been placed on the southern side where they will stay cooler in the heat and catch our south-west breezes. We have paid special attention to cross ventilation to force air movement diagonally through the rooms. 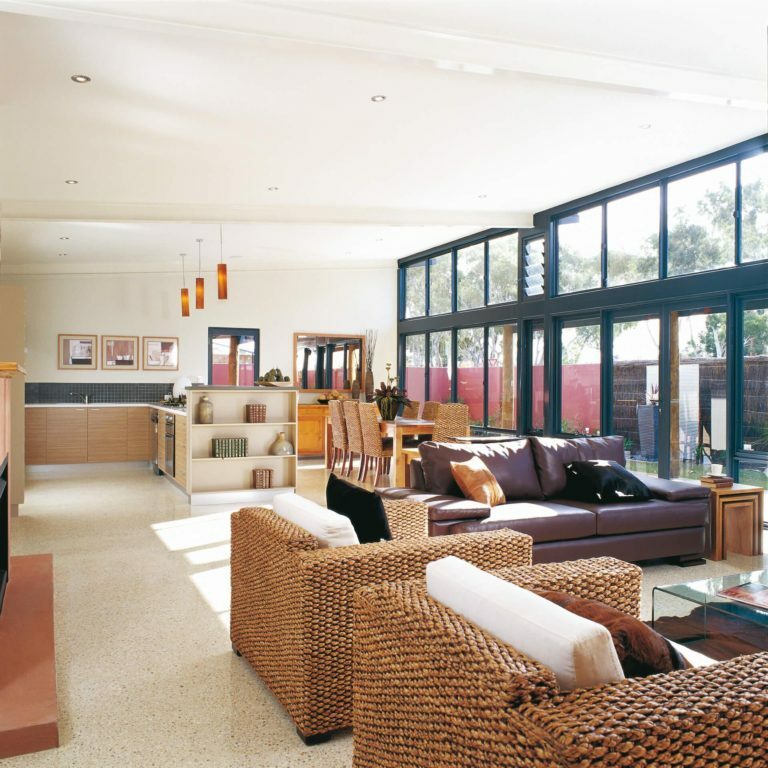 The windows to the living area have also been designed to control airflow through the home. The top windows can be opened to remove large amounts of hot air if necessary. The awnings are for providing ventilation but at a reduced airflow level and the louvres provide air intake at the bottom and outtake in a more controlled sense. The main living space forms a rectangle that allows a very free formation of furniture. The raked ceiling enhances this space with its volume. We have added the architectural touch and clean look of ceiling cornices. The fireplace provides the possible option of winter heating, an option which may not be necessary. 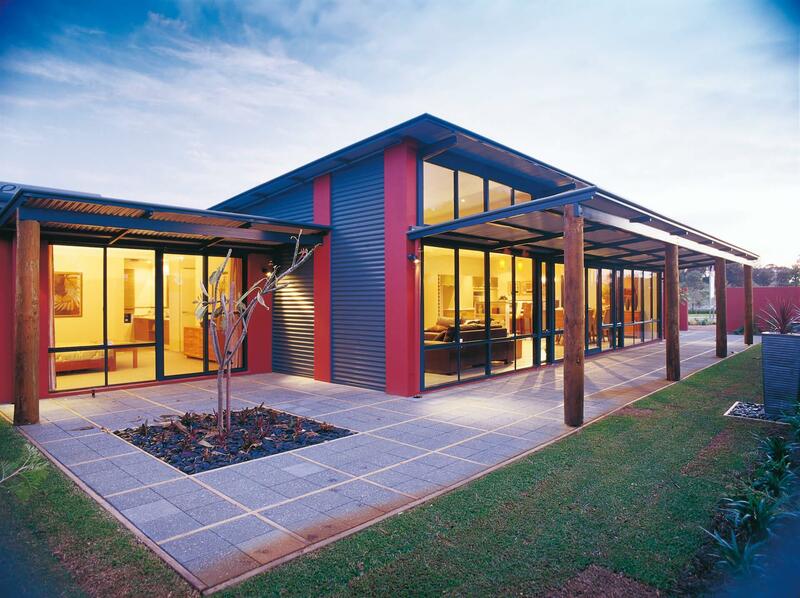 The design philosophy used in the kitchen is the same that is embraced in most of Rural Building Company display homes. It allows the interaction of the chef with the guest if one is entertaining and carries on from our work that we did in design with a celebrity chef. The upstand screens the cooking while providing air exhaust. Standing around with a drink and talking to the chef is easy with the bar-like top. Corian has been used throughout with Clark Epicure sinks. The Westinghouse oven with a separate grill has been placed aside from the 5 burner hotplate. We have used 2 appliance cupboards to allow appliances to be concealed but easily used when needed. Large pull out draws has also been built into this kitchen. The balance of accommodation was the choice of 2 large bedrooms which will easily take queen size beds with an optional studio. The bathroom is large and again embraces the inset bath and very large shower. The large master suite is contained at the opposite end with its separate office. We chose not to attach the garage to the house so we could illustrate how the house would sit in a non-urban situation. It is very easy to either attach it or provide a carport if that is required. We believe we have given another strong environmental option. On display we have used a water-wise garden, minimised lawn, stormwater sump to put the roof water back into the aquifer, in the clay soils this needs to be fitted with a water tank. On the south side, we have used a blue metal path to restrict weed growth, we have also reduced the possibility of paving transmitting heat back into the home with the timber separators between slabs. Of course, we have kept our GreenSmart features such as gas boosted HWS, additional insulation to the Colorbond cladding, AA rated plumbing features and fittings. If you are interested in this sort of architecture but find that the home may not meet your financial plan, please talk to a member of our staff for the options that are available. We have alternative versions of the design to achieve different outcomes.